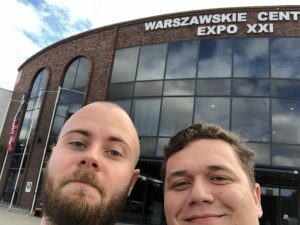 At 30 of June 2018 in Warsaw Expo XXI along with 7 of our colleagues from Pretius, I took part in Confitura 2018. It was conference for Java developers with quite local character. I have experience with bigger conference Geecon in which I took part in 2016, so I thought that Confitura is good for comparison. First of us arrived in Expo at about 7:30 AM. We had Pretius roll-up with us (Pretius was one of the partners of Confitura 2018), so we had a lot of time to find the best spot to place it and of course to eat something and drink coffee :-). After receiving pass from staff, we started planning in which presentations we want to take part. After opening ceremony we made for in hall called “Spiżarnia” for presentation about anti-patterns in projects. Paweł Lewtak talked about his experience what practices which are popular in managing IT projects are most damaging. I think that most of these type of presentations are about IT “utopia” in projects and after few years working as a developer I know that this type of perfection is nearly impossible. 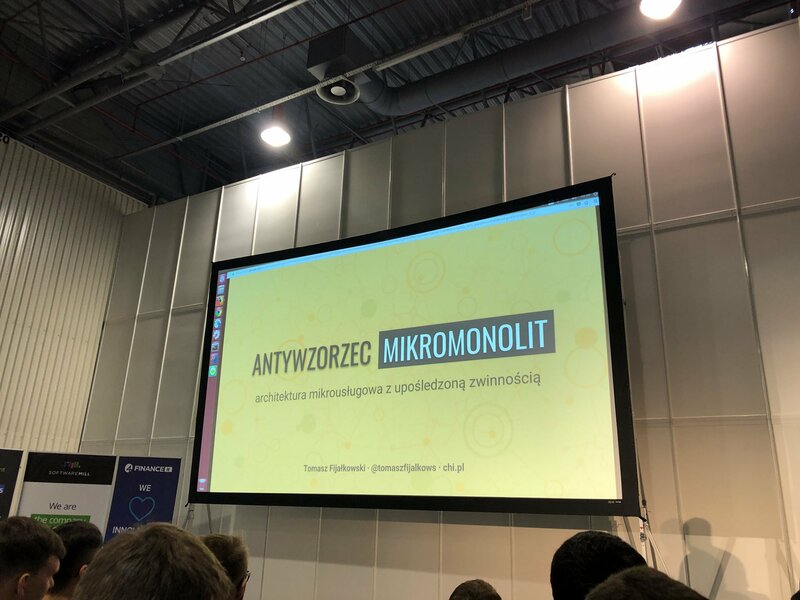 Second presentation was a story and experience of Allegro IT getting from monolith architecture to microservices presented by Tomasz Fijałkowski. 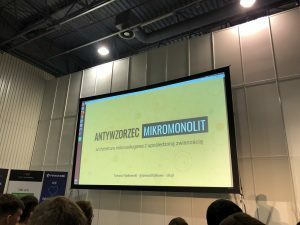 He mainly talked about what is the most necessary in microservices project as splitting responsibility about modules in way that teams can work as much independent as it is possible. In my view, next presentation by Mateusz Parada was the most amusing during the conference. He talked about typical frame of mind and life habits of developers. All in all there was a lot of truth in his words, after he presented charts from StackOverflow with statistics about developers life, some of listeners reacted laughter. Also quote about ordering kebab was one of the most “catchy” in all presentations. Last speach before lunch was presented by my colleague from university, Michał Lewandowski. I was very interested how he will cope with as a speaker. His presentation titled “24 hours per day” was about time planning. I think his life after changes he made became a little bit artificial and too much arranged. On the other hand he presented some interesting applications and ideas which can help organising daily timetable. After Michał’s presentation we started to search something tasty to eat. We ate some goulash for lunch and ice cream for dessert. In my opinion first presentation after lunch was the most attractive all day long. It was about deployment processing with Kubernetes. 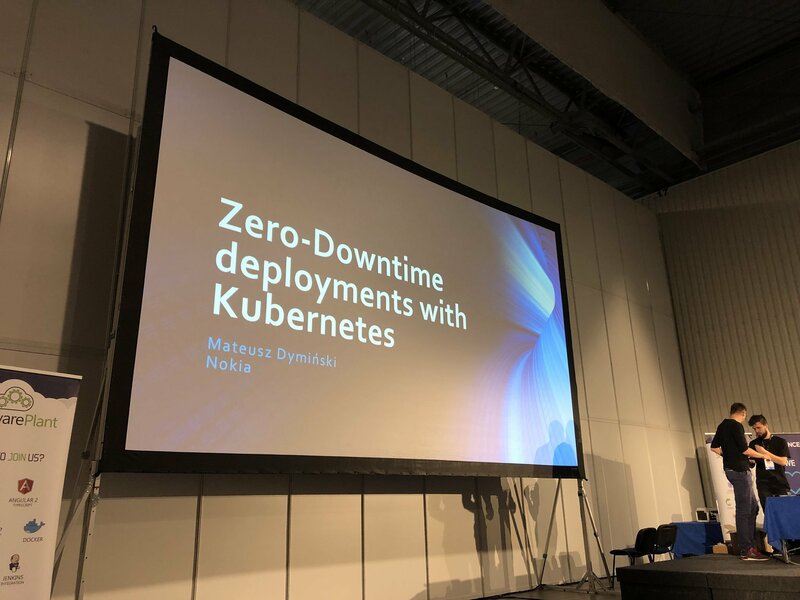 Mateusz Dymiński presented in a few words idea of Kubernetes and he presented this in live demo. For me live demos and live coding on presentations are the most interesting. Mateusz presented some ways of deploying a new version of app provided by Kubernetes. Also he presented how to implement grace period in shutting down Spring-boot app which might be useful in one of our projects. Sixth presentation was the most appealing for all of our team, not because of topic but because of presenter. It was presented by Łukasz Rekucki, he is a younger brother of one of experts from Pretius. Also he is mainly FE developer opposite to his brother. In my opinion the introduction was too long but when he got to main point all of us said that presented idea of using WebFlux could be very useful in some cases. I think it would be nice to have opportunity to use it in project. The last presentation was also created by my colleague from university, Dominik Przybysz. 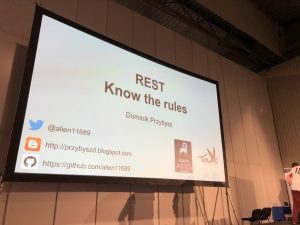 He presented way how to develop REST webservice using all rules of becoming “RESTful”. Also he pointed out some interesting fact about using HTTP methods and statuses. Well, it’s nice to know about it because most of project use mainly POST and GET without paying attention in other possibilities. To conclude, I try to compare Confitura with Geecon. Geecon is more “worldwide” and there is possibility to listen to speakers from the biggest companies from all over the world. On the flip side, Confitura is an internal conference and big names are compensated us for presenters who are “developers next door” with whom we can identify easily. All in all I think it would be nice to take part in Confitura next year.